December 31, 1994 was New Year eve with a difference for me. Usually on days like that, I would be floating around with my friends in some drunken revelries. Strangely, on that evening, my mind and mood were somber and I was eagerly waiting to see the curtain rise in the jam-packed Music Academy Hall in Madras. The singer was a Hindustani musician of great repute. Despite my limited knowledge about Hindustani music, I sat through the entire concert. I strained hard to contain the swelling emotions in my heart with each strain of her music. Great music poured from her heart with astounding felicity and charm. Her sweet tone, its flexibility and cadence painted a musical canvas that was at once dreamy, haunting, passionate, elegant, sad and romantic. 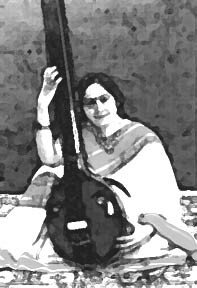 The singer was none other than Parveen Sultana, the empress of Hindustani classical music. I have spent many hours of my life hooked to classical music, listening to great maestros like inimitable M.D. Ramanathan, Palaght Narayana Swamy, Madhuri T.N. Sheshagopalan, Bade Gulam Ali Khan and even to many younger musicians of great talent like Neyveli Santhanagopalam, Sowmya, Balaji Shankar and Sanjay Subramaniam. I believe that the key to all good music, whether it is classical, popular or even ghazal, is its composition. The elements of compositions are chords, melody and rhythm but especially melody. The melody of a music can be so evocative that listening to an old song can sometimes bring an onrush of nostalgia in our mind because it belonged to a specific period setting in our lives, may be our childhood or college days. Melodies create emotional images and landscapes in our mind, much the same way a good movie soundtrack enhances the visual images on the screen. It is this aspect that makes music so powerful, emotionally purgative, purifying and relaxing. Of all the realms of art I have frequently dabbled in myself, no art has given me such perennial joy and solace as classical music. I was, in fact, not one of those blessed ones to have had a formal training in classical music in my early life. My approach to music has always been childlike and intuitive. My ears, like most of my friend, had a penchant for the popular music and listening to it required no preparation or skill. My first tryst with classical music was through Kathakali, the much-acclaimed classical dance of Kerala. Being an avid fan of Kathakali, I had a special fascination for Kathakali music, which is set to Ragas in Carnatic music. The fundamentals are the same. As I listened to the various padas or stanzas in Kathakali, many of its Ragas like Thodi, Sindhubhiravi, Dwijavanti made an everlasting imprint on my mind. Soon I started attending regular Carnatic music recitals and to my sheer excitement, I realized that I could identify many of the Ragas in Carnatic music because of my background in Kathakali music. Somehow, this kind of a quest that I undertook in learning and understanding true music is not very common today. Unfortunately, the present generation of youth is more in search of mind-blowing cacophony than soul stirring music. I wish if only they knew that with a bit more of patience and a keener ear, they would be opening the doors of a lifetime of enjoyment, reaping the endless joy and ecstasy of classical music. I have often heard many people say they can't appreciate classical music. Don't say you can't appreciate music because you don't know the language. Music is a universal language that speaks directly to the soul. The emotions conveyed are feelings each of us has. The problem most listeners face is not one of understanding but rather of insight. They can hear the music but they are frustrated by the feeling that they must be missing something since they have not studied this art form. The point they miss is that classical music is entertainment and need not be education. I don't think that music exists for any inner probing or lacerations. Classical music is something impersonal; it keeps reaching for perfection in the voices of great singers, but never attains it. In fact it should not try for the inexpressible, because it is the very embodiment of the inexpressible. This may be why the great French writer and Nobel Laureate Andre Malraux said, 'Music should try to say nothing or it should be oblivious of all desire to say anything. It begins where words end but in a sense so does poetry, which trembles and sways above its scaffolding of words, just as a sculptor transfigures the marbles as he hacks at the marble. And after a while the words are nothing, they are merely flotsam and jetsam and only the poetry or music itself remains, composed of words but freed from words.' Thus in any music, it is not the song, but how it sings in your heart that matters. Once, two American students came to study under the great impressionist painter Henry Matisse and told him ' We want your color'. Matisse replied, 'If you have not brought your color, you will never get mine'. This is true about music also. If you have no music in your heart, you will never learn and enjoy music. Great music requires purely subjective reactions; if a raga sound joyful to you, then that is what it is. Remember, there is no human emotion that cannot be portrayed through great music. Don't be afraid to react to what you hear. Remove the shackles- laugh, cry, smile, admire and even dislike what you hear. But react! It will make the listening experience much more fun and joy. For me, the enchantment still goes on. I still wander in pursuit of unheard melodies, for they are sweeter than the heard ones.